Dunstanburgh Castle is not an easy castle to reach. Its location on the Northumberland coast of England is fairly remote, beautiful though somehow eerie and desolate. It was whilst driving back from a visit to Bamburgh Castle that we had the opportunity to see this magnificent medieval ruin for ourselves. As soon as it came into view in the distance, it seemed to loom with a striking, almost ghostly silhouette against the skyline. The 'ghostly' part of that description is very apt: Dunstanburgh Castle is reputed to be haunted - and by more than one ghost! 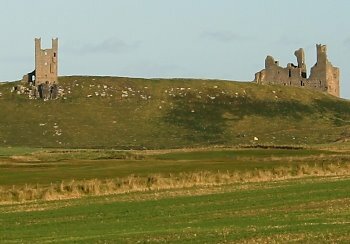 Once the largest castle in Northumberland, Dunstanburgh Castle was built in the 14th century by Thomas, Earl of Lancaster, nephew to the then King Edward II. Having led a rebellion against his king, Thomas was executed for treason in 1322. His execution, however, was not quick and he died an agonising death because of the executioner's inexperience. It's because of this that his ghost is said to haunt the castle that he built - Dunstanburgh. Another ghost reported to haunt the castle's grounds is that of Sir Guy, a knight who sheltered nearby during a storm. His legend tells of a wizard and Sir Guy's attempt to rescue a young woman from the castle to no avail only to become a ghost without a shadow, searching throughout the centuries for the lady he sought to rescue. There's more on haunted Dunstanburgh Castle in our haunted English castles section for anyone interested in reading further.